A serial killer stalks prostitutes on the mean streets of Las Vegas. This movie should have been called "NIGHT OF THE SLOPE WALKER." Mack Hail plays the SLOPE WALKER, and he is good at walking at a slope! Nobody walks at a slope like Mack Hail. If you notice when you watch this movie, Mack Hail is walking at a slope and that adds to the creepiness of his character. I really liked his friend, the spider. The Slope Walker confides all his secrets to the spider. That spider was a good actor! I liked the way he laid out his silk while the Slope Walker told him secrets. I have a friend who tells all his secrets to his pet cat, Charlie. He even has a picture of himself whispering in to Charlie's ear, and he put a little cartoon dialogue bubble with words in it. The Slope Walker is nice to the spider, who survives the whole movie. But he is not nice to other people and to grass! He kills lots of people and when he gets mad, he throws himself on the ground and tears out the grass. That's pretty scary, to think somebody is walking around here in Vegas at a sloped angle and killing people. Now, when I walk around on the strip and everything, I always keep my eye out for whoever is not walking straight up and down. If people are walking tilted over at an angle, I am careful to avoid them. If they are crazy, I will avoid them like crazy! I don't want to get "sloped," if you know what I mean. Slope for slope, this movie delivered the goods! I hope they make a sequal to this movie. They could call it, "THE SLOPES OF FIRE." Or maybe, they could combine Mack Hail's character with something like the Creature from the Black Lagoon, and call it, "SLOPAZOIDS FROM THE DEEP." And if they could get Vin Diesel to co-star in it with Mack, they could call it, "THE SLOPEAROUND GUYS." That would be cool! Vin Diesel could walk at a slope! Or, they could put a sci-fi edge to the movie and call it, "THE SLOPE FROM OUTERSPACE." This movie concept has so many possibilities! 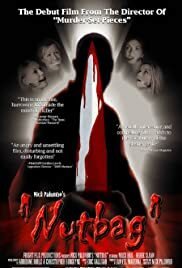 If you like movies about murders, people who get angry, naked women, spiders, knives, and slopes, then you will like this movie! All five of my thumbs are up! 20 of 45 people found this review helpful. Was this review helpful to you?